Travis Bowman is an entrepreneur, author, actor, and film producer. 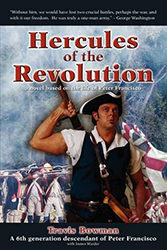 In 2009, Travis released a novel titled Hercules of the Revolution which is based on the life of his famous ancestor, Peter Francisco, from the Revolutionary War. In 2011, Travis produced the first ever television documentary about his ancestor called The Peter Francisco Story, and it won a Platinum Aurora Award. After working with the US and Portuguese governments to dedicate a new statue in the Azores for Francisco, Travis re-released his novel in 2016 as an “anniversary edition” called LUSO: for Love, Liberty, & Legacy. He is currently working with a film studio based in North Carolina on a full-feature film that will be based on his novel LUSO. www.lusothemovie.com. Travis stands 6’6″ tall just like his great(5x)-grandfather and he has brought his ancestor to life through a 30-minute dramatic impersonation over 100 times for historic societies, schools, universities, and church groups all over the world. In 2013, he had the honor of bringing Peter back to life in his Portuguese hometown, Porto Judeu, where Francisco was kidnapped at age 5. He has been a guest on several nationally syndicated radio & TV shows, and he’s meet with many dignitaries, including the President of Portugal, about his novel and future full-feature film. His work has earned him numerous awards and accolades and dozens of newspapers have published articles about him around the world. Travis and his wife have 2 children and they reside in Charlotte, NC. For more info visit: www.travisbowman.com.